Even I admit I may have been a bit “hard” in this review of AquaGlass by Docrafts. When you are reading or watching it please keep in mind these are only my own personal opinions and it is possible I have a bad set of paint. 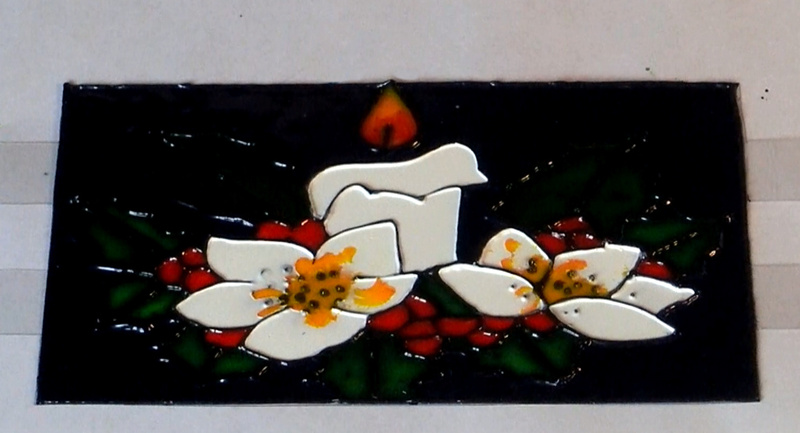 Having said that my opinions are based on more than 15 years experience of glass painting. 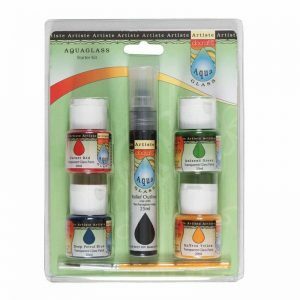 The review is based on a purchase of an AquaGlass starter set which contains an outliner, 4 paints and a paint brush. The set was purchased for about £10 at “The Range”. This is waterbased flowing glass paint and outliner. AquaGlass by DoCrafts. The Outliner. As many of you will know my preferred method of outlining is using a piping bag. Having said that I found this outliner and more importantly the bottle quite good. The bottle produced a line which is reasonable for smaller work and the outliner dried to a smooth shiny finish. This is one of the best oputlining bottles I have used for quite a while and the outliner itself does the job well. It won’t stop me from using a piping bag in the future as I feel I get more control with that. I will however keep this bottle handy as it will be good for doing little bits of touch up work which don’t really warrant making up a piping bag. AquaGlass by DoCrafts. The Glass Paints. After liking the outliner the paints came as a bit of a disappointment. For a start the green was totally unusable. It had gone thick and bitty. obviously this wasn’t how they were meant to be and I assume the bottle was badly sealed. The blue was thick and “glupey”. Again I would hope this wasn’t how it was meant to be. The yellow and the blue really weren’t bad. They flowed quite well, blended and gave the standard of finish you would expect from a waterbased paint. 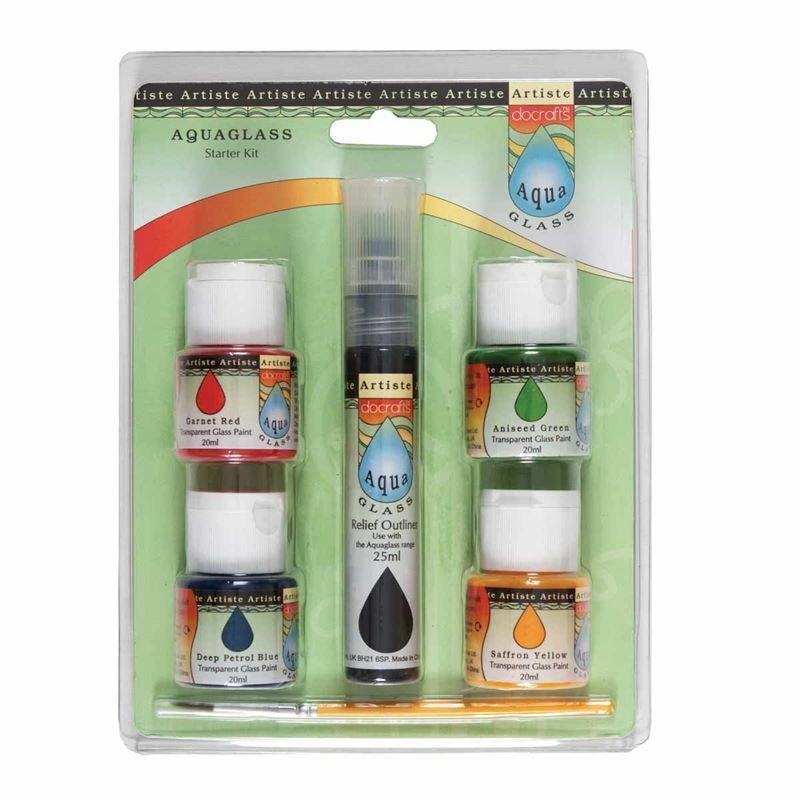 AquaGlass Glass Paints by DoCrafts. Using these paints made me thing about the whole issue of flowing waterbased glass paints. 15 or so year ago I used to recommend them to some people as they had clear benefits over the solvent ones. The were a lot less smelly and were pliable so good for using on acetate etc. But now solvent based paints smell a lot less and are also pliable. Not only that but the solvent based paints give a finish which is more transparent and were the colours are “sharper”. So the question is “Why would anyone choose to use waterbased paints? If the paints do something different then great. For example the thick peelable paints or the bakeable ones then that is fine. But if you just want a standard flowing glass paint I think solvent based paints are much better. (This doesn’t just apply to the AquaGlass waterbased paints. This applies to flowing waterbased paints across the board). The only time I would recommend flowing waterbased paints would be when working with children but they are quite expensive so you would probably be better off with homemade ones. More Glass Painted Christmas Decorations.